Francesco I (25 March 1541 – 19 October 1587) was the second Grand Duke of Tuscany, ruling from 1574 until his death in 1587. He was the second grand duke of the house of Medici. Born in Florence, he was the son of Cosimo I de' Medici, Grand Duke of Tuscany and Eleanor of Toledo, and served as regent for his father starting in 1564. On 18 December 1565, he married Joanna of Austria, youngest daughter of Ferdinand I, Holy Roman Emperor and Anne of Bohemia and Hungary, after among others Princess Elizabeth of Sweden had been considered. By all reports, it was not a happy marriage. Joanna was homesick for her native Austria, and Francesco was neither charming nor faithful. Joanna died at the age of thirty one in 1578. Soon after the Grand Duchess Joanna had died, Francesco went on to marry his Venetian mistress, Bianca Cappello, after aptly disposing of her husband, a Florentine bureaucrat. Because of the quick remarriage and similar occurrences among the Medici (Francesco's younger brother Pietro had reportedly killed his wife), rumours spread that Francesco and Bianca had conspired to poison Joanna. Francesco reportedly built and decorated Villa di Pratolino for Bianca. She was, however, not always popular among Florentines. They had no legitimate children, but Bianca had borne him a son, Antonio (29 August 1576 – 2 May 1621), in his first wife's lifetime, and following the death of Francesco's legitimate son Philip de' Medici, Antonio was proclaimed heir. Francesco also adopted Bianca's daughter by her first marriage, Pellegrina (1564- ?). Like his father, Francesco was often despotic, but while Cosimo had known how to maintain Florentine independence, Francesco acted more like a vassal of the Habsburgs of Austria and Spain. He continued the heavy taxation of his subjects to pay large sums to the empire. He had an amateur's interest in manufacturing and sciences. He founded porcelain and stoneware manufacture, but these did not thrive until after his death. He continued his father's patronage of the arts, supporting artists and building the Medici Theater as well as founding the Accademia della Crusca. He was also passionately interested in chemistry and alchemy and spent many hours in his private laboratory/curio collection, the Studiolo in the Palazzo Vecchio, which held his collections of natural item and stones and allowed him to dabble in amateur chemistry and alchemical schemes. Francesco and Bianca died on 19 and 20 October both at the Medici Villa in Poggio a Caiano. Although the original death certificates mention malaria, it has been widely speculated that the couple was poisoned, possibly by Francesco's brother, Ferdinando. While some early forensic research supported the latter theory, forensic evidence from a study in 2010 found the parasite Plasmodium falciparum, which causes malaria, in the skeletal remains of Francesco I, strongly bolstering the infection theory and the credibility of the official documents. Investigations of Francesco's facial hair that were found among his remains have detected low levels of arsenic and rules out chronic exposure of arsenic. However, the whereabouts of Bianca's remains, in the form of some of her internal organs, were located in some broken terra-cotta jars buried under the crypt in the Church of Santa Maria a Bonistallo, near Francescos villa. Testing showed proof that support the theory of arsenic-poisoning. The same findings were detected in organs from Francesco. It is believed that Francesco and Bianca were given small doses of arsenic for several days until it killed them. But the doses were probably too small and given over a too short period of time to be detected in Francesco's facial hair. In this way their symptoms, such as fever, stomach-cramps and vomiting, easily could be misinterpreted as some kind of infection and disguise poisoning. Francesco was succeeded by his younger brother, Ferdinando I de' Medici, Grand Duke of Tuscany. 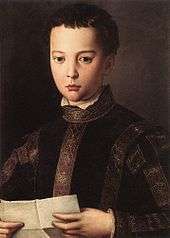 There is a famous portrait of Francesco as a child by Bronzino, which hangs in the Uffizi gallery in Florence. Francesco's marriage to Bianca and the couple's death was exploited by Thomas Middleton for his tragedy Women Beware Women, published in 1658. Eleonora (1 March 1566 – 9 September 1611), who married Vincenzo Gonzaga, Duke of Mantua (1562–1612). Marie (1575–1642), who became Queen of France by her marriage to Henri IV in 1600. ↑ Francesco Mari; Aldo Polettini; Donatella Lippi; Elisabetta Bertol (2006). "The mysterious death of Francesco I de' Medici and Bianca Cappello: an arsenic murder?". BMJ. 333 (23–30 June 2006): 1299–1301. doi:10.1136/bmj.38996.682234.AE. PMC 1761188 . PMID 17185715. ↑ "Medici Family Cold Case Finally Solved : Discovery News". News.discovery.com. 14 July 2010. Retrieved 18 March 2012. ↑ Archived 29 July 2010 at the Wayback Machine. Hibbert, Christopher (1979). 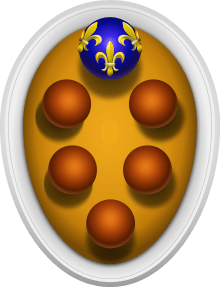 The Rise and Fall of the House of Medici. Penguin Books. pp. 269–281. "The Medici Archive Project Bio Page"